Our crafters have been busy making affordable items for Christmas and these are now on sale in the museum shop. 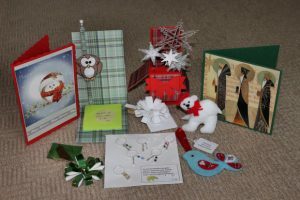 Christmas cards range from 30p to £1.50, packs of wine glass charms made with Swarovski crystals are only £2.50, felt tree decorations for £1, packs of gift bows with tags for £1 and memo pads for £1.50. Why not come along and take a look? All sales benefit the museum. Heron. Friends of the Museum receive a 10% discount on purchases in the museum shop.